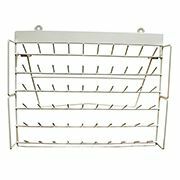 Professional quality deluxe heavy duty Hilos Iris thread display rack. This all metal rack holds up to 60 Mini-King 1100 yard spools and may be used freestanding or can be hung on wall to free up counter space. Holds 6 rows of 10 spools each. 9/4/2016 – Is the rack white? Response From Enmart: Yes, the racks are indeed white.